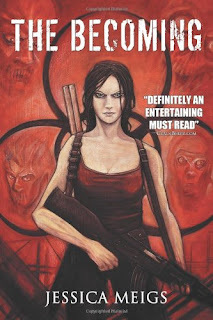 The Becoming is the first book in a zombie series by Jessica Meigs. The Michaluk Virus is loose. In the heart of Atlanta, Georgia, the Michaluk Virus has escaped the CDC, and its effects are widespread and devastating. Most of the population of the southeastern United States have become homicidal cannibals. As society rapidly crumbles under the hordes of infected, three people—Ethan Bennett, a Memphis police officer; Cade Alton, his best friend and former IDF sharpshooter; and Brandt Evans, a lieutenant in the US Marines—band together against the oncoming crush of death and terror sweeping across the world. As Cade, Brandt, and Ethan hole up in a safe house in Tupelo, others begin to join them in their bid for survival. When the infected attack and they’re forced to flee, one departs to Memphis in search of answers while the others escape south to Biloxi, where they encounter more danger than they bargained for. And in Memphis, the answers that one man finds are the last answers he wanted, answers that herald a horrific possibility that there may be more to this virus than first suspected. Some things to note going into this review: it contains minor spoilers for season one of The Walking Dead, and I still haven't seen season two. I appreciated a lot of the traditional zombie elements of The Becoming, but what I really loved was the fast paced beginning. I was hooked right away and tearing through the pages. I think it is safe to say Meigs is an old school fan of zombies. Even though her zombies are the 28 Days Later flavor, they do have some Romero tossed in and a nice twist on the intelligence of the zombies. 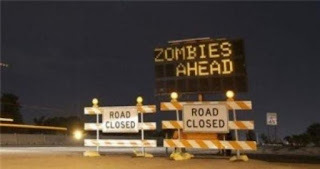 A funny thing happened on the way to the zompocalyse, though. My personal experiences and preconceived notions started to get the better of me. The best way I can relate this is to compare The Becoming to The Walking Dead. If you love watching The Walking Dead, you will probably also love The Becoming. The Walking Dead and The Becoming have some of the same problems for me. I couldn't get past the fact that they were able to drive in and out of Atlanta (both). Just panning down to the bumper to bumper abandoned cars on the highway below (The Walking Dead) wasn't enough for me. I live in hurricane alley. I know when everyone needs to get up and go, there are no roads and there is no gas. I also have preconceived notions about the CDC. If it didn't bother you that the man's wife in the CDC footage at the end of season one (The Walking Dead) ran the CDC and still managed to get infected, it won't bother you that the Michaluk Virus (The Becoming) originated at the CDC. I also know when the gov'ment clears a city, there is no going back. There are two distinct parts of The Becoming with a jump in time between the two. The characters were far more likeable in the first part - which contained most of the creepy zombie build up and page turning action - than they were in the second part where everyone's frustrations, fear, and cabin fever were closing in upon them. By the end of The Becoming, however, the characters had joined back together, gotten closure on some things that were eating at them (no pun intended), and they seemed ready to band together for survival. This shows a lot of promise as to where this series could be heading. Much in the same way I'm still a fan of The Walking Dead, I will keep my eyes (and my mind) open for the next installment of The Becoming. ...I wrote this really eloquent, nice thank you note, and my stupid browser ate it lol. And now, of course, I can't remember what I said! Lemme see if I can remember. I couldn't get past the fact that they were able to drive in and out of Atlanta (both). Just panning down to the bumper to bumper abandoned cars on the highway below (The Walking Dead) wasn't enough for me. I live in hurricane alley. I know when everyone needs to get up and go, there are no roads and there is no gas. I also have preconceived notions about the CDC. If it didn't bother you that the man's wife in the CDC footage at the end of season one (The Walking Dead) ran the CDC and still managed to get infected, it won't bother you that the Michaluk Virus (The Becoming) originated at the CDC. This isn't necessarily factual, just throwing this out there: you'll find out a LOT more about the whole virus-and-the-CDC thing in the second book, and all I can say without spoiling anything is that there's a lot more to it than just a lab-tested petri-dish thing lol. Sorry - Atlanta would be specific to TWD. The driving itself would be both. I was actually thinking of Cade and Ethan. Very helpful review. Sometimes details trip me up so I can totally understand. I really need to read a zombie book. I'm not sure where to start. I'll consider this one when more books in the series are completed. Gotta love zombie books. I've just recently started reading them, and I'm totally addicted! So, thanks so much for sharing the review and bringing this one to my attention!